It took months of scouring various support forums, but I finally found a method for getting around GoDaddy’s annoying habit of interfering with email posting via a .NET form. So, you should now be able to contact me via a simple form with any work requests. After perusing multitudes of articles, I believe I finally have a wonderfully clean, mobily-styled version of this site. If you’re viewing this on a mobile device, you should already be seeing it! Lots of thanks, hat-tips, shaking of grateful fists at: A List Apart (eternal source of awesome), especially articles by Ethan Marcotte and Dominique Hazaël-Massieux. Also, this wonderful slideshow by Bryan Rieger was a huge eye-opener. Fargo has been draped in a lovely melancholy fog the past couple days, and there are few opportunities that offer as beautiful a setting to capture on film, so to speak. See for yourself. Well look at that; it’s an update, and a new face for the site (complete with collagen and the accompanying massive depression!). Yes, I trashed the old layout and heaved ’er into the dumpster out back. You like, yes? If you don’t, that’s okay; we have some hairy-knuckled assistants waiting outside to correct your perception. In other news, I believe the re-release of Stonecreep’s fantastic latest album, “The Deathmarch Crushes On”, is now for sale, either through their site or through many fine distributors. Be sure to check out the updated artwork by yours truly. It came out wonderfully, if I may so. I have a long break coming up, in which time I hope to get going on a few things waiting in the wings of my dank mental belfry. Good day. The site has been updated to be HTML5 compliant, and I’ve switched to JQuery for the Lightbox galleries, as it’s leaner and just better all around. Updates have been scarce as I’ve been in the process of moving and getting life back into some sort of order. I’m planning a lot of projects right now, so hopefully I’ll have fruit to bear soon enough. Whoa, it’s an update. I think I’m as surprised as you are. I had some credits rapidly approaching their curdle date over at iStockphoto, so I found some cool stuff to purchase and play with. Have a look at “The Wrong Alley”. This one even creeps me out a little. Wow, I am awful with updating. I am doing some maintenance with the site yet again, and hopefully I’ll find the time (i.e. cattleprod the laziness from myself) to get the form up and running as well as post some new stuff. Go go gadget slacker smacker. 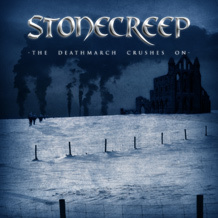 The design for the cover and credits panel for the new Stonecreep album, The Deathmarch Crushes On is now posted in Album Covers. This is probably my best work to date and from what I’ve heard so far, the album is going to be amazing. You can check out the newly posted tracks at Stonecreep’s Myspace page. And, if you live in the Fargo/Moorhead area, come check out Stonecreep live Saturday 11th, 10:00 PM at the Aquarium. Cheers! Almost all the content is up. Huzzah! I just have to finish the form for the Contact page, then you can bother me to your heart’s content, faceless human who is perusing my words.